The Weatherclock is more than just a clock sporting Nixie tubes and neon lamps. There is even more to it than the wonderful workmanship and the big, beautiful pictures in the build log. [Bradley]’s Weatherclock is not only internet-connected, it automatically looks up local weather and sets the backlights of the numbers to reflect current weather conditions. For example, green for roughly room temperature, blue for cold, red for warm, flashing blue for rain, flashing white for lightning, scrolling white for fog and ice, and so on. 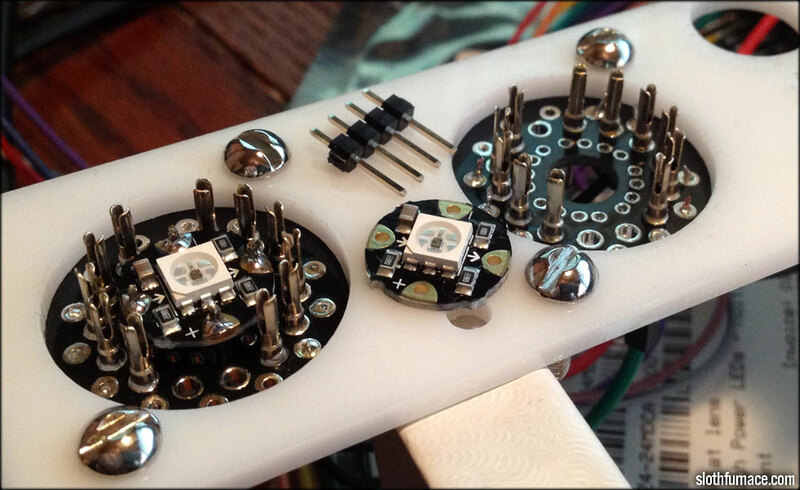 The enclosure is custom-made and the sockets for the tubes are seated in a laser-cut plastic frame. While seating the sockets, [Bradley] noticed that an Adafruit Neopixel RGB LED breakout board fit perfectly between the tube leads. 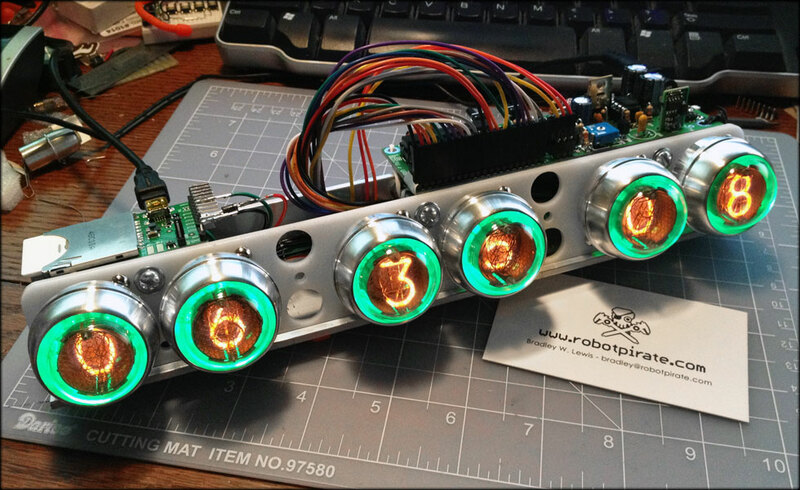 By seating one Neopixel behind each Nixie indicator, each number could have a programmable backlight that just happened to look fabulous. Wit h an Electric Imp board used for WiFi the capabilities of the Weatherclock were rounded out on the inside. On the outside, a custom enclosure ties it all together. [Bradley] says his family had gotten so used to having the Weatherclock show them the outside conditions that they really missed it when it was down for maintenance or work – which shouldn’t happen much anymore as the project is pretty much complete. It’s interesting to see new features in Nixie clocks. Nixie tubes have such enduring appeal that using them alone has its own charm, and at least one dedicated craftsman actually makes new ones from scratch. Looks amazing! I love the neopixel lights to show the weather. Very good for just a glance on the way out of the door. It looks amazing too. The back reflection makes it look nice and smooth. The cable management on the inside looks amazing too! I agree, one of the photos on the build log is the cable management – it’s really nice with covered wire bundles and everything. Or like installing blue LEDs in a vacuum tube socket. Electric Imp is a poor choice for any project. Can you elaborate as to why you believe this? It’s provably a very good choice for many people, especially if you’re concerned about security, or scaling for production. In a few minutes you could probably make your own list. Start with the premise that it’s a poor choice and try to come up with a few reasons why it might be so. Start with the premise that electric imp *may not* be aimed at *you* specifically, and its value may become clearer. If you are specifically interested in writing every single piece of code in your product, and maintaining it (and keeping it secure) forever then sure – it’s not a good choice as you don’t get to do that with imp. However, people actually making hundreds of thousands of products, needing to keep them secure for a decade or longer, and who are more interested in moving valuable data back and forth than tweaking network stacks to deal with obscure real world network issues and keeping up with CVE’s, actually find electric imp the perfect platform to use. – Yes it relies on our servers. This is a good thing. Our business (with almost a million *commercial, paid* devices on our service) is to run these servers and keep them up. This means you don’t have to get woken by a pager, because someone else is paid to do that. Turns out, lots of companies including large public ones – not just startups – trust us to keep our service running… so why do you have a problem with that? I agree people like running servers as a hobby, but be realistic, it’s a necessary evil in a commercial context. Not everyone wants to be a sysadmin. Shipping lots of devices and want to run our code on your own servers, with your own HSM-hosted signing keys, TLS certs and DNS? Sure, we can do that for you too, even with our source code in escrow if you want. – It’s closed source, yes. Open source is not provably better for security (openssl? gnutls? linux? ), and the open source we do use (lwip, mbedtls, squirrel etc) we fix bugs in and feed the patches upstream as we are good open source citizens. We have security experts who are paid to keep our system secure. Did you know that every imp does ECDHE forward secrecy now, yes even the old imp001’s from amazon? Do you know that we do ed25519 challenge response on connections with per device secrets? Do you know that it’s impossible to do stack exploits on an imp as the MPU is used appropriately? Do you know of any other platform that seamlessly upgrades the security of every customer’s device in order to stay ahead of security risks? The imp architecture is certainly different, but it actually allows us to maintain security for every customer without them needing to be involved every step of the way. That’s rather key in IoT. Oh and our system has been through many independent pentests contracted by our large customers. – We do not charge developers for service, period. This is absolutely clear, and will always be the case. A lot of our commercial customers started on the developer service, why would we prevent people trying the platform for as long as necessary? Makes no sense. – If you don’t like the IDE, you can use your own tools and our API to push code/get logs/etc. See our website. The IDE is great for getting started quickly though. The person who made this lcock obviously has mad design & woodworking skills, maybe they decided that they didn’t fancy trying to parse JSON on an ESP when they could achieve what they wanted in an hour or so with an imp, and then never, ever have to worry about going back to fix breakages. That’s as good a reason as any to use imp as a developer or hobbyist – you make something and it’ll continue working. Time is the most limited resource for most people. If you still don’t see a need for a comprehensive, well maintained IoT platform then that’s ok. We have plenty of people who are really, really glad we exist to do the stuff they don’t want to do. What do you mean, “hack a clock”? This -is- a clock.